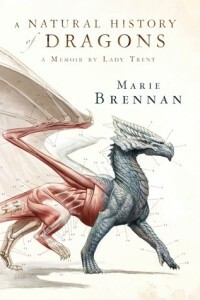 ‘A Natural History of Dragons’ is a memoir written by Lady Trent (or Marie Brennan in our dull reality), telling of her life from her younger years, through to her older as she discovers a girl really can be as lucky as to involve herself utterly and completely with dragons. It is the year 1895 in a magical realm that’s quite alike Victorian England. Females are expected to grow to be proper and marry well, even when dragons exist and who really wouldn’t want to run away and be amongst them! An interest in dragons is considered to be a masculine trait though, so Isabella (must hide her interest as much as she can. Her father however, notices his books have been touched and has a closer eye on his daughter than she suspects. And so, he does the very best thing any father in that time can do – he ensures she manages to marry a man who will truly make her happy. Soon they go on adventures that no female could have even dreamed of, yet become possible thanks to knowing the right people, and wealth that enables them to be known to be a bit mad. Being wealthy and of title doesn’t make everything so easy though, and once they’re out of the comfort of where society dictates everything, Isabella and her new husband soon find themselves in quite a bit of trouble, where somehow, the fact that dragons are killing people is the least of their worries. This book, although not quite as similar in plot so much as feel, will hopefully appeal to fans of Mary Robinette Kowal’s ‘Glamourist Histories’ series. Both are set in the same time, with the introduction of the fantastic interwoven with detail of what it was like to live in that time. The characters are dedicated throughout. Isabella is eager yet naïve, showing that at her young age a woman can still be intelligent and yet wanting. Her husband doesn’t come across as strongly, but we still smile at his sudden acts of kindness, and see how a man from those times could be reserved and yet thoughtful. What really makes this book wonderful is the illustrations by Todd Lockwood, and how they’ve involved throughout the book. Please take the time to check them out. This review was originally posted at SentientOnline on the 11th February 2013.